TV Review: Broadchurch -- "Season 1, Episode 2"
The first episode seemed like a pretty straightforward setup for a typical murder mystery, but this week’s installment indicates Broadchurch may be going for more than your typical whodunit. Yes, there are the expected plot twists revealing that certain individuals may be hiding something, but more than anything there’s an oppressive sense of stasis, as if the community is so traumatized by Danny’s murder they’re unstuck in time. Several scenes find characters just walking, lost in their thoughts—Hardy exploring the cliffs, Danny’s mother Beth aimlessly wandering the aisles of the grocery store—which suggests that Broadchurch is just as interested in the emotional and social effects of a crime as the investigation into who committed it. Now that most of the major players have been introduced, director James Strong takes his time establishing a strong mood and peeling away the layers of small-town etiquette in the face of tragedy. What he uncovers is one of the most fascinating explorations of grief in recent memory. How should we respond when confronted with loss, both in our own lives and in the lives of others? That’s the question driving this episode, and its ultimate conclusion is there is no right answer, only the struggle to find one. When faced with such devastating grief, there’s the feeling that one “ought” to do something, from offering personal condolences to the family to creating a memorial fund, but there’s no guarantee that will make anyone feel better. In fact, it could just make things worse. “Be a decent person,” local hotel owner Becca (Simone McAulley) tells shop owner Laurie (Bill Fellows), who seems more concerned with how the murder will affect his business than with how to respond “appropriately” and respectfully. That’s easily said, but nobody knows quite how to do it. Laurie comes off as insensitive, but he’s really not that much more selfish than anyone else. Strangers stop and stare as Beth nearly breaks down in the grocery store. A word of sympathy from someone inspires rage rather than comfort. A public statement of support for the community is interpreted as a grab for fame. And even Becca hopes that the murderer will be caught in time for her to earn a few of those summer tourism dollars. Some trauma runs so deep that the only way people know how to try and make others feel better is to do what makes they themselves feel better, even if those gestures are hollow or damaging. If the first episode of Broadchurch was about death, the second is about life after death, whether it’s a supernatural afterlife or the day-to-day struggle to cope with loss. In an unexpected twist, the series doesn’t ignore the former. A new character, telephone engineer Steve Connolly (Will Mellor), claims to be able to receive psychic messages from the dead, and he might actually be telling the truth. Detectives Hardy and Miller are immediately hostile—after all, police work relies on concrete evidence, not unproven claims—but Connolly seems sincere, and he even brings up something from Hardy’s past that nobody else should know. What initially seems like a goofy attempt at comic relief soon becomes a fascinating development for an otherwise standard police procedural. It’ll be interesting to see how Broadchurch handles these metaphysical themes and how the possible presence of supernatural insights—or, at least, the desire to believe they’re true—affects the investigation. This episode also introduces a compelling new character in the form of Rev. 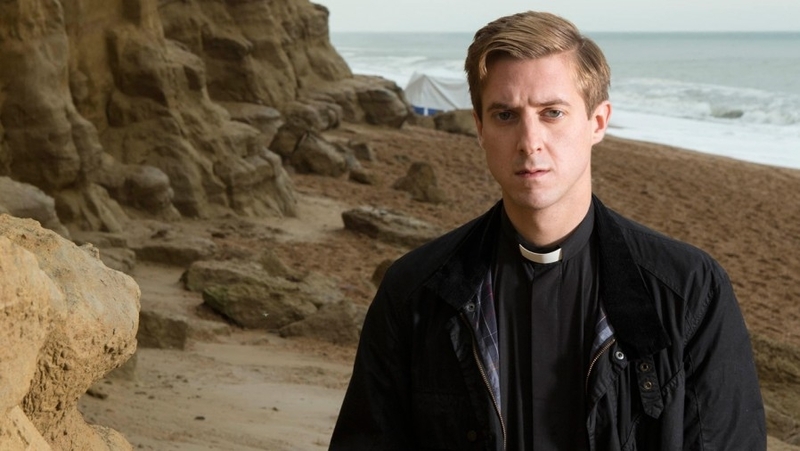 Paul Coates (Arthur Darvill), a vicar who becomes one of the few people to whom Beth feels comfortable opening up. He seems genuinely interested in helping her through her grief, and he doesn’t judge her when she reveals she’s pregnant and “it’s complicated.” Many films and television shows cast religious figures in broad strokes, often as hypocritical wolves in sheep’s clothing, but so far Coates seems like a real, complex person of faith. He doesn’t always seem certain that he’ll say the right thing, but he does his best, and most of all he seems willing to listen (as he reminds Beth, belief in God “isn’t compulsory” to receive his compassion). But even he seems flawed, or perhaps unconsciously acting out of self-interest. Danny’s grandmother Liz (Susan Brown) encourages him to connect with the town, to help them through this tough time; he does so by making a televised statement of support. Beth seems moved by his words, but Mark reacts violently, interpreting it as a tactic to increase church attendance. And he’s not entirely wrong; Coates does seem to be looking for a way to attract more people to his services. “Your God left my son for dead!” Mark tells him, and for all practical purposes he’s correct: God or no God, Danny won’t be coming back. Christians often stereotype atheists as cold rationalists that refuse to acknowledge the healing power of God, but the truth is, the mystery of God can sometimes become a source of further pain. One of the uncomfortable realities of faith is that there is no guaranteed source of comfort in times of crisis. This episode of Broadchurch did a fantastic job exploring the confusion that sets in after a traumatic event, and I hope the show continues to be willing to embrace the uncertain. As Danny’s grandmother Liz tells Coates, “People never know what they need until it’s given to them.” All we can do is try our best to be decent people and accept that, despite our best intentions, we won’t always succeed. TV Recap: Breaking Bad -- "Blood Money"